Training Cave fighters Brandon Brearley, Noah Nicholls and Freddie Phillips with their coaches. The Training Cave Boxing Gym, in Birstall, were well represented at the SYD ringside show in Knottingley last Saturday night. Brandon Brearley put up a great performance in a skills fight. He has progressed well and the next time he steps foot in a competition ring it will be a scored bout. 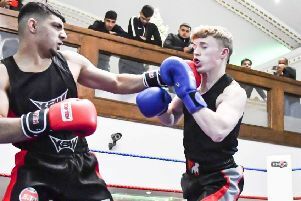 Noah Nicholls was involved in a tear up against an opponent who had far more experience in the ring, having had double the amount of fights than the Birstall youngster. At times, it proved to be a scrappy fight that could have gone either way but Nicholls’ relentless work on the inside the final round earned him the win via split decision. Freddie Phillips produced another brilliant display to claim a unanimous points win. Phillips appeared to make a slow start but picked up the pace in the second and third rounds. He gave his opponent a standing eight count in the last round which helped him earn victory. The Training Cave have a busy schedule of bouts coming up including their first home show, which will be held at the Brain and Brawn gym in Morley on December 1. The Training Cave is based at Unit 20, Carr Mills Business Centre, Bradford Road, Birstall and offer a range of boxing classes. Under-14 sessions, aimed at nine to 13 year-olds, are held each Monday, Wednesday and Thursday and is £3.50 per session or £8 per week. Adult sessions are held on the same evenings and are priced £5 per session or £12 for the full week.